This cement truck driver in China must have been confused when he tried to pull away and couldn't because his back tire had sunk into the roadbed. Local officials discovered three large pits under the road that resulted from erosion or unauthorized work activity. 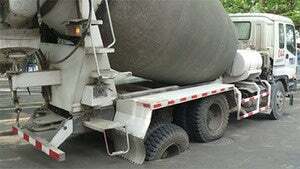 Cars could drive over these gaping underground holes, but the weight of a 12-ton truck was too much for the road to bear.